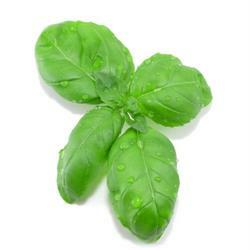 Basil essential oil clears your head, is uplifting and very good for your nerves! I have often used basil in a diffuser when studying for various exams or just when I want to concentrate........it really does work. The lovely aroma will be familiar to most people as it is very similar to the smell of the popular culinary herb from which it is obtained. The leaves are a symbol of love in Italy (and is believed by some to be an aphrodisiac!). The name basil comes from the Greek word 'basilicon' which means 'a royal remedy'. It was used in baths and body massage by ancient Greek nobles for its fragrant aroma. It is a sacred herb in India (called tulsi), where it is believed to offer protection to the soul, and an important ingredient in Ayurvedic medicine. There are three different types of basil that are readily available, but the most commonly used (and recommended) in aromatherapy is sweet basil (Ocimum basilicum ct. linalool). The other two are Exotic Basil (Ocimum basilicum ct. methyl chavicol) and Holy Basil (Ocimum sanctum) which is also known as Tulsi. Light, fresh, herbal and sweet. Basil essential oil is very uplifting and excellent for mental fatigue. Great to use in a diffuser to help concentration when studying. Useful for treating all kinds of respiratory infections such as bronchitis. Gentle massage over the stomach with basil oil can help ease digestion problems. Basil blends especially well with lavender and used together in aromatherapy massage is terrific for tight and tired muscles - an excellent blend to use with athletes and dancers. Use in inhalations for head colds, head-aches and migraines. Use in a gentle massage over the abdomen to help with painful periods. Good for treating mosquito bites and wasp stings....also a good essential oil to use in an insect repellent blend. Can be used as a mouthwash to help ulcers and gum infections. Great for sluggish skin....and improves the tone and appearance! It is often used to treat the symptoms of acne and skin infections. Basil is a powerful depressant if over-used. Do not use with children under 16. Basil tends towards yang but has both hot and cold properties. Basil has been used for the bites of insects, snakes and scorpions.